Oliver loves his ABCs and a lot of our play is somehow tied into the alphabet, but every once in a while I can get him to branch out. He enjoys BBQ'ing a burger for me on his grill, washing his hands in his sink, microwaving popcorn in his microwave and cooking mac & cheese on his stove. 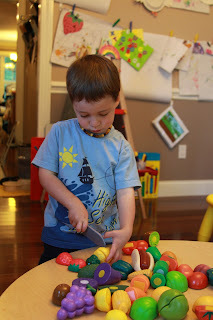 Tonight we took out our drawer of cutting foods and started slicing! 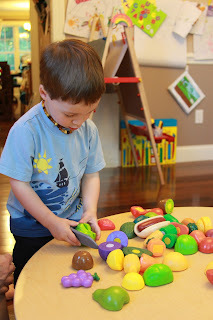 I absolutely love the Melissa and Doug cutting foods, but they are crazy expensive. I found this set of cutting fruits and veggies and couldn't believe the price. 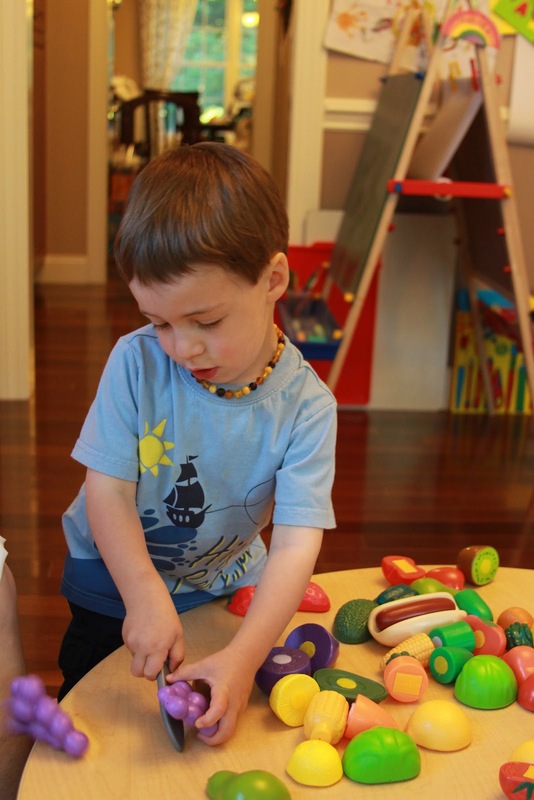 They are absolutely perfect for his little hands. He still needs help handling the knife in the proper fashion, but he does a great job at cutting up his fruits and veggies! 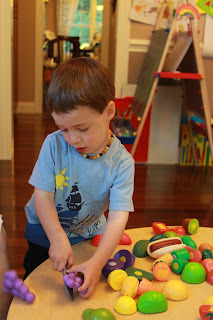 And bonus... this activity is awesome for his fine motor control. 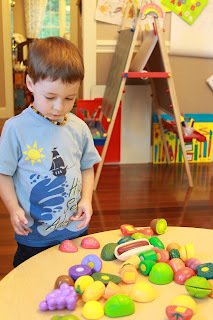 Again, a fun activity of learning through play. Hmmm.... which one shall I choose next? Trying to pry apart the broccoli didn't work out... had to go with the knife. It quickly became a game to see how fast he could keep cutting while Mommi and Grammi were frantically putting the pieces back together! He finally won and all the pieces were all separate. Oh, and let's not forget those ABC's! He quickly began "carrot, c-c-carrot begins with 'C'."